The Gender-Affirming Surgery Experience Survey in BC is the result of a collaboration between the Stigma and Resilience Among Vulnerable Youth Centre (SARAVYC) at the University of British Columbia, and Trans Care BC, a program of the Provincial Health Services Authority. Trans Care BC’s role is to enhance the coordination and availability of trans health services and supports across the province. The Survey had 337 respondents and was open to anyone residing in Canada who had undergone assessment and/or surgery in the last five years. Due to SARAVYC’s partnership with Trans Care BC (which began its work as a program in October 2015), we focused recruitment efforts on British Columbia for this first report. The survey asked trans people who were at various stages of accessing gender-affirming surgery about their experiences with this process, including their experiences with surgery readiness assessments and with various surgical and other procedures. Frohard-Dourlent H, Coronel Villalobos M, & Saewyc E. (2017). 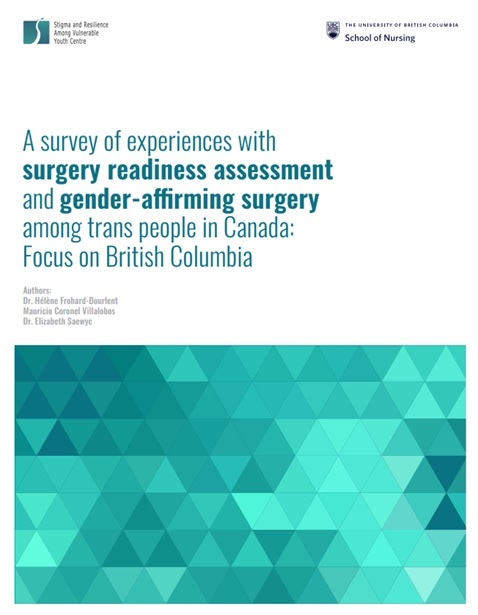 A survey of experiences with surgery readiness assessment and gender-affirming surgery among trans people in Canada: Focus on British Columbia. Vancouver, BC: Stigma and Resilience Among Vulnerable Youth Centre, School of Nursing, University of British Columbia.